A Brierfield soldier, Pte. George Kenniford, home on leave, has (as we stated on Saturday) been the bearer of sad news to Mr. and Mrs. Illingworth Ingham, of Bullions Close Farm, Lane Head, Briercliffe. Their son Lance-Corpl. 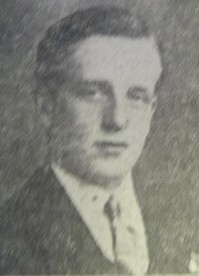 Ernest Ingham, Welsh Fusiliers, had just prior to his comrade's departure, fallen in action. Having joined up in June 1916, Lce.Cpl. Ingham was subsequently sent out to serve with the forces in Palestine. He then went to France, where he won high praise for gallantry. He was 23 years of age, and unmarried. He was well-known as a clever boxer. He is on the roll of Honour of St. James Parish Church, Briercliffe. His grandfather's the late Ebenezer Wood, yeoman farmer, and Connor Ingham, hairdresser, of Abel street, Burnley, were men of good standing. Pte. Geo. Kenniford, Jewel Mill, was with Ingham when he fell on the 21st September, and rendered what help he could. Thanks to Dave Ingham for the image.